Offering you a complete choice of products which include thermal conductive tape and conductive tape. 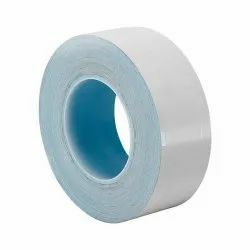 Thermal Conductive Tape is made with such kinds of adhesive and different thicknesses (from 0.05 mm to 0.5 mm) that heat is conducted away from sensitive components while uneven surfaces are properly flattened and filled. The adhesive is also electrically isolating the surfaces and available with one or two side release paper or film. Thermally conductive adhesive transfer tapes are used for mounting thermoelectric cooling modules, bonding heat sinks to microprocessors, bonding TAB-mounted IC and power transistor to PCB, and power transistor to heat sink in notebook computers, high performance CPU, chipsets, mobile, electronic appliances, power conversion and amplification modules etc. 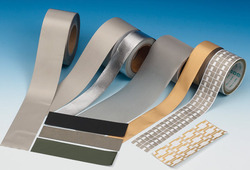 We are able to gain immense expertise in delivering Conductive Tape. The offered range of conductive tapes are developed by trusted associates, who ensure to made it utilizing high grade raw material and innovative technology. Along with this, the offered range of conductive tapes are suitably checked on different characteristics to maintain its authenticity throughout the designing process.